Net profit rose 19 percent from a year ago to $10.7 billion in the fiscal fourth quarter to September 30, Apple said. Revenues were up 12 percent to $52.6 billion. Release of the earnings figures pushed Apple shares up more than three percent to $173.20 and came as iPhone X models began hitting the market in some time zones. The flagship handset features facial recognition, cordless charging and an edge-to-edge screen made of organic light-emitting diodes used in high-end televisions. It marks the 10th anniversary of the first iPhone release and hits about 50 markets around the world Friday. In Hong Kong, buyers who had pre-ordered the phone online queued to pick up their new purchases, saying they were willing to pay for what they saw as a landmark model. "It's the 10th anniversary phone -- anyway, other phones like the Samsung are not much less," said banker Tony Yeung, 35, as he queued outside the Apple store in Hong Kong's Festival Walk mall. "It's convenient. You can unlock the phone just by holding it up to your face in bed after you wake up," Yeung added. He said he had bought two of the 64 GB version, costing HK$8,588 ($1,100), one for himself and one for his wife. The 256 GB model costs HK$9,888. Student Keith Li said all his friends were changing to the new phone and had set aside money for it. Li, 22, had traded in his old phone to help him meet the cost. Inside the Hong Kong store, those still considering whether to buy were trying out facial recognition after concerns it may compromise the security of the phone. Nam So, 36, said he was happy to use it, preferring it to touch ID, which opens the phone at the touch of a finger. If your thumb is sweaty then it won't unlock. Face ID would solve this problem," he told AFP. Around 300 customers waited overnight outside Singapore's Apple store, the first shop in Southeast Asia to sell the new model. Supakorn Rieksiri and Kittiwat Wang, both 22, said they had flown in from Bangkok on Thursday to pick up pre-orders of two phones each. "With all the different features like facial recognition and the bigger screen, it's all quite worth it," said Rieksiri, adding that the second handset was a gift for his mother. The iPhone is its main profit driver, accounting for more than half its revenues. In the latest quarter the firm was able to reverse its fortunes in China, boosting overall sales by 12 percent in the "Greater China" region. Sales were up in other regions except for Japan, which saw an 11 percent revenue drop. 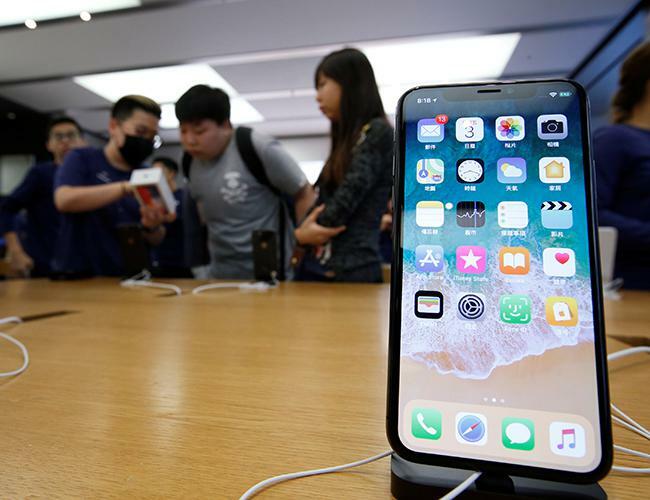 Smartphone sales climbed by about a million units to 46.7 million in the three months winding up the California company's fiscal year, according to the earnings report. Apple chief executive Tim Cook called it a "very strong finish" to 2017.